Well, we've finally arrived! Welcome to the final instalment of our Global Digital Citizenship in 15 Minutes blog series. This series covers the 21st Century Fluencies and Global Digital Citizenship. It shows how to explore them with students in 15 minutes or less each day. This time around, we look at the Global Digital Citizen. Let's continue by exploring the essence of the Global Digital Citizen. You can also download the free Global Digital Citizen QuickStart Guide for more information. As always, the QuickStart Guides are essential companions for discovering the Fluencies. There's no one quite like the Global Digital Citizen. This citizen is conscientious, respectful, and compassionate. 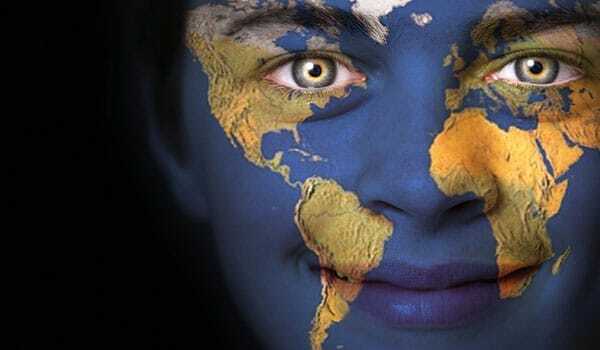 It's an individual who strives to establish a sense of global community. They practice this in all online and offline relationships, duties, and endeavours. The Global Digital Citizen is defined by 5 unique tenets. They are Personal Responsibility, Global Citizenship, Digital Citizenship, Altruistic Service, and Environmental Stewardship. All of the Fluencies are learned within the context of the Global Digital Citizen. Here are some examples of how they can tie together. Using Solution Fluency, you could create a scenario for solving a global crisis. Information Fluency helps parents (and teachers) learn best practices for protecting kids online. Creativity Fluency can help your students create dazzling environmental awareness flyers and campaign materials. With Media Fluency we learn appropriate usage of media and messages in online and offline applications. Collaboration Fluency helps students nurture positive environments when working with those of various cultural backgrounds. We have all become global citizens in a digital world. Global Digital Citizenship is the core values and identity by which we live our lives. This is something we strive to have students understand and apply. These activities are great for introducing the Global Digital Citizen to students. It's a great way to learn the essence of the digital citizen "honour code." Digital Citizenship Survival Kits: There are lots of ideas for these out there. They teach important tips using visual association. For example, a padlock reminds students to use good passwords and protect intellectual property. Try these suggestions from Craig Badura, K-12 Blueprint, and TechChef4U. Cultural Food Fair: Students can discover lots about other cultures through food. This activity gets students to experiment with making ethnic dishes. In the process, they learn something about other cultures they didn't know before. Once they're done, the dishes can be shared with the class in a multicultural celebration day. Getting a Move On: Students can be inspired to pursue health and fitness in fun ways. What better way than to make their own videos? The "Obesity Fighters" from Australia's Newport Gardens Primary School have got the right idea. They've created a series of fitness videos for their school and community to benefit from. Students can get fit and help others at the same time. Tools for Sharing and Learning: Get one of our most popular downloads, the Digital Citizenship Agreements. They set guidelines for ethical use policies with technology. There’s one for primary, middle, and senior school. 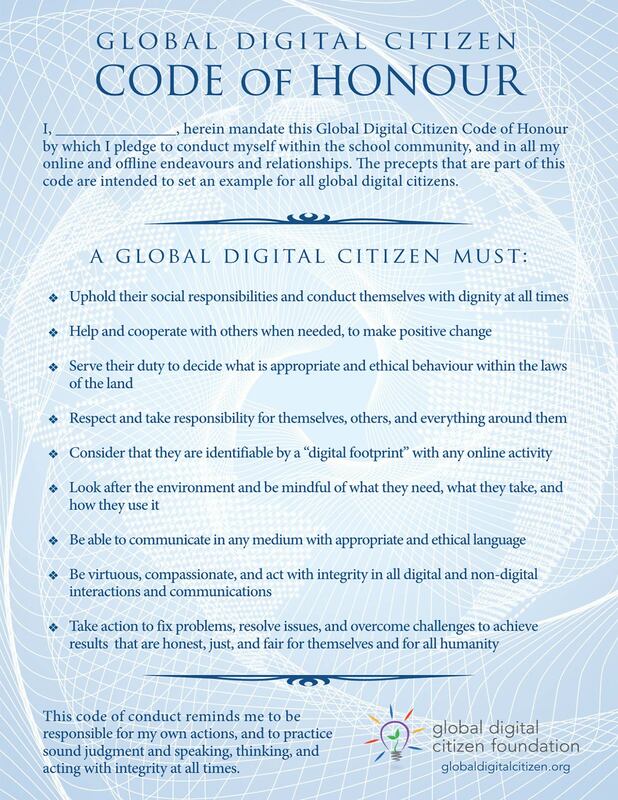 We've also got a shareable Global Digital Citizen Honour Code below. It showcases the best values of the Global Digital Citizen. Share it, print it, and let students put their name on it. It can be something they commit to with pride. Global Digital Citizenship can be studied with mini-lessons. This can help students develop an understanding of its tenets. You can do this over a few days. Devote a bit of time to letting students explore each tenet. You can use the resources below. This encourages a shift in responsibility for lifelong learning to the student. Developing accountability for quality of life is key here. It's about demonstrating how to govern yourself in everyday affairs. This includes personal finance, ethical and moral boundaries, health and fitness, and all relationships. Personal responsibility is a crucial lesson for any student. It can be taught beginning at any grade level. The more students see the benefits of personal responsibility, the more interest they have in it. Good Character has some great K–5 lessons for teaching responsible behaviour to students. This article from Tusculum College explores how responsibility is being introduced to college students. Check out these 10 Ways to Encourage Students to Take Responsibility for Their Learning. This tenet reminds us that boundaries no longer exist. We are interconnected like never before. As such we are all global citizens. Global Citizenship recognizes how technology and digital media have dissolved those boundaries. It reminds us we are citizens enabled by communication, collaboration, and support across all levels of society. Our students must continue to stay aware of the issues, religions, values, and cultures of their fellow citizens. This requires tolerance and understanding. They can then link this with a mindset of sensitivity and humility. This is how they will truly begin to change the world. Here are 10 tips for helping you promote global citizenship in your classroom. These are resources for global citizenship from Edutopia's 5 Minute Film Festival. Explore these resources for teachers from Signposts for Global Citizenship. This means putting your best foot forward in online environments. Digital Citizenship is about having accountability for appropriate behaviour. This fosters independence and refers back to personal responsibility. Digital Citizenship breaks down into 6 different subcategories. It starts with respect for self, for others, and for property. We then have responsibility for self, for others, and for property. Common Sense Media has some of the best digital citizenship resources on the Web. OSAPAC is an Ontario-based hub for teaching digital citizenship practices. There's some good stuff here to check out. This Resource Roundup from Edutopia is another digital citizenship goldmine. This tenet focuses on a healthy concern for the well-being of others. It includes embracing opportunities for charity and goodwill toward others. This creates relevance and meaningful connections to the real world for our students. Caring for others has a twofold benefit. Practicing (or even just seeing) acts of goodwill increases our serotonin levels. This contributes to a feeling of well-being and happiness. It occurs both in the person giving and receiving the action. This can lead to vast improvements in mental, emotional, and physical health over time. So basically if you do something nice for someone, everybody wins! Get some ideas for altruism from Random Acts of Kindness. Take a few suggestions from the students at Kansas State University. Watch how a group of them band together to support fellow students. Kindness is infectious and can spread without us even knowing it. Don't believe it? Watch this video. We have but one world to live in, and we're all on it together. Practicing Environmental Stewardship ensures we do our best to protect and preserve it. It's about a demonstration of common-sense values. There are so many ways to appreciate the beauty and majesty around us every day. Environmental Stewardship encourages us to do just that. It urges us to explore how to best make use of Earth’s resources. It means taking responsibility and action on personal, local, regional, national, and international levels. The Green Schools Initiative has lots of resources for practicing environmental stewardship. Another initiative to explore is Project Green Schools. GoGreen Initiative is a global environmental program that trains teachers and volunteers in schools. We hope you've enjoyed the Global Digital Citizenship in 15 Minutes series. It's been made to give you and your students a better understanding of the Fluencies. Be sure to go over to our resources page for lots more free tools you can use. Have any ideas for resources you'd like to see from us? Let us know in the comments!